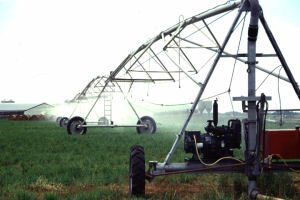 Irrigation equipment can be used to land apply manure with a solids content of up to 2-3 percent depending upon the type of equipment used and nozzle size. The types of systems typically used are stationary (also called solid-set), traveling guns, and center pivots. Irrigation equipment is typically used to land apply liquid manure from anaerobic lagoons and runoff holding ponds. If applied manure is undiluted, calibration requirements may differ slightly from those systems using diluted manure. If manure is diluted with freshwater, nutrient concentration must be adjusted by the dilution ratio when calculating nutrient rates. Always check with your state regulatory agency for calibration and reporting requirements. Related: Calibrating solid manure spreaders and irrigation equipment. As with the other types of equipment used for land applying manure, calibration consists of verifying application rates and application uniformity. Application rate and uniformity is measured by collecting applied manure in rain gages that are placed in a line for traveling gun and center pivot systems or in a grid for stationary systems. Systems using undiluted manure may require measurement and reporting of application rate from the gun or nozzle and not what is collected in a rain gage if plant available nutrients are calculated to include evaporative losses and volatilization. If measuring application rate from the gun, a flow meter or pressure measurement at the nozzle and a manufacturer’s performance chart for the gun/sprinkler and nozzle will be required. Collected depths are used to calculate commonly-used measures of irrigation equipment uniformity such as the Christiansen uniformity coefficient (CU or Uc) or distribution uniformity (DU). Details of how to setup uniformity evaluations and calculate measures of uniformity and application rates are given in the links in a paragraph at the end of this document. It is important that these types of systems be operated as designed. Normally this means that pressure and flow rate should be field-verified in the calibration procedure and compared to the design values or the ranges recommended by the manufacturer. Pressure should always be measured at the nozzle, not at the pump or other location. Pressure can be measured either with a pressure gauge mounted on the sprinkler riser or mounted on the gun body (for big guns) or measured using a pitot tube placed directly in the nozzle stream. For center pivots with drop nozzles, pre-set pressure regulators are normally located on the drop tubing, so nozzle pressure is known. In addition to pressure and flow rate measurement, the wetted diameter of the sprinkler or gun (for solid set and traveling gun systems respectively) should be measured. It is generally recommended that flow rates be within 10 percent of the design rate, and that wetted diameter be within 15 percent of that specified in the manufacturer’s chart at the measured nozzle pressure. Flow rates may be obtained either by using a flow meter or by using values obtained from the manufacturer’s chart at the measured pressure. For animal waste systems, flow meters are normally temporarily placed in the main irrigation line either in-line or temporarily strapped on depending upon the type of flow meter used. Adjustments to achieve the proper application rate and uniformity include adjusting operating pressure, travel speed (for traveling gun or pivot systems), replacing worn nozzles, and operating systems when there is little wind. Changes in equipment (e.g. nozzle size) should not be done without consultation with an irrigation specialist. Lesson 36 Calibrating Manure Application Equipment from the Livestock and Poultry Environmental Stewardship (LPES) Curriculum offers an overview of the different equipment used to land apply animal manure, including irrigation equipment. North Carolina Cooperative Extension has a series of publications that can be used to evaluate application uniformity for stationary, traveling systems, and center pivot or linear move systems. Calibration of Lagoon Irrigating Equipment from University of Missouri Extension provides information on how to calculate application rates and depths for stationary and traveling type systems.